We are able to re-string not only tennis rackets but also Badminton and Squash racquets. We stock a range of basic club strings through to performance strings which will enhance your game. We offer a 24 hour turnaround service. If you play once a week you should change your strings once a year to optimise performance. Over time strings lose elasticity, control and power. As part of the stringing service we are able to replace bumpers, grips and enlarge grips. 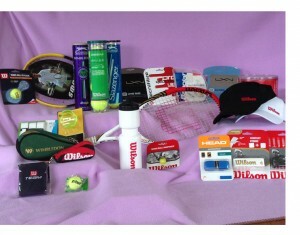 We supply a small range of tennis accessories various grips, water bottles, dampners, hats, sweatbands etc. We have contracts with some wholesalers such as Prince, Wilson, Head and several other brands. Prince are one of the main suppliers of Wimbledon merchandise and we at A&M Tennis have the rights to market some of their products. These consist of tennis bags, dampners, etc. Griffins are our preferred supplier of tennis equipment such as rackets, clothing and shoes at a negotiated 20% discount through our membership of A&M Tennis. Interested in individual or group coaching?